Paper mache (or papier mache) is such a simple craft. Not only is it simple to do, it is also extremely low cost. However, you shouldn't underestimate what you can achieve using basic paper mache recipes and techniques. As well as using paper mache in layers to make objects, you can also use it as a clay. We've selected some of the most interesting and innovative recipes and projects to share with you, including tips for getting a smooth finish on the surface of your project. While this might not matter for some projects, if you want to decorate your surface with rubber stamps or finely detailed painting, you'll require a surface which is as smooth as possible to work on. read on for recipes and tutorials to get you started with paper mache. Learn how to make traditional paper mache using just flour and water (with a little extra salt, depending on where you live). You will find a recipe and video tutorial here, showing how to make a cooked paper mache paste. Once you have made your paper mache paste you can use it to make a variety of projects including a cute piñata. These instructions and video will get you started! 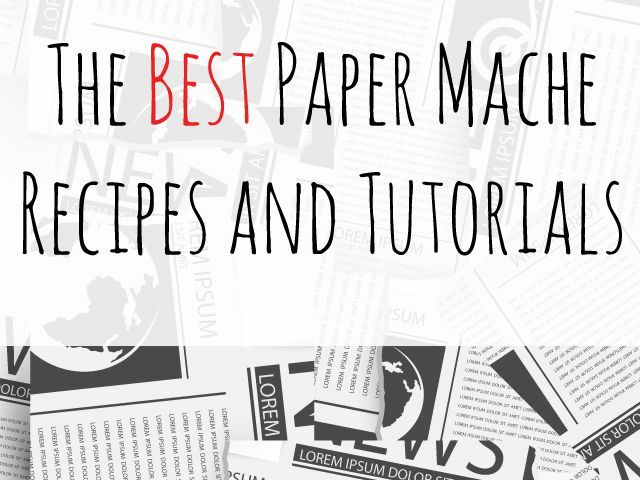 The Ultimate Paper Mache site contains a wealth of information to get you started making paper mache objects and to help you take your skills on to the next level. You will find recipes along with lots of tips, tutorials, and videos to get you creating and finishing a variety of objects. In addition to traditional paper mache, you'll also find recipes for paper clay. Learn how to make paper clay using simple household ingredients. You could use the finished clay in a similar way to salt dough. These cute hot air balloons are surprisingly simple to make, using just a balloon, paper mache, and a few embellishments. They would make a great way to add some decoration to a party or celebration. This tutorial shows how to create a glitter finish on a papier-mache object. While this project uses a ready-made papier mache object, you could use this technique to add a layer of glitter to your own finished papier mache items. Here's a super simple way to emboss texture and patterns into wet paper. While this isn't as robust as paper mache or paper clay, it's a great way to make toppers for cards and scrapbook pages. Ashley Hackshaw from Little Blue Boo shows how to make a paper mache animal head in this detailed step by step tutorial. Molly Moo Crafts shows how to make these cute hen decorations using paper mache. You'll also find a free printable template to help you get the basic hen shape. Over on the Pretty Prudent website, we learn how to use simple paper mache techniques to create a modern looking lampshade. These paper mache light globes are made using tissue paper. The tissue paper is transparent enough to let light through to make pretty light garland party decorations. This bracelet is made by layering pieces of paper which have been soaked in paper mache glue onto a card tube base. The instructions are short, however, the project is relatively self-explanatory. If you have scraps of decorative paper left over from other projects then how about upcycling them into a pretty and useful bowl. This project uses paper mache techniques, however with a twist! OK, so this tutorial isn't in English, however, there are lots of photos which will make this tutorial easy to follow, particularly if you have read some of the tutorials explaining how to make paper mache objects.